La stazione della metropolitana è a soli 3 minuti a piedi da casa e la metropolitana va direttamente alla stazione ferroviaria di Santa Maria Novella in 7 minuti. Oppure, se si sceglie di camminare, è solo 15 a 20 minuti piacevole e facile passeggiata lungo il fiume Arno, con una splendida vista di Firenze. Ci sono spazi di parcheggio a pagamento (circa 14 euro per un biglietto di giorno; domenica gratuito) di fronte l'edificio e l'accesso alle autostrade principali si trovano a 10 minuti di auto. Io abito nelle vicinanze e disponibile 24/7. Felice per offrire raccomandazioni su ristoranti, musei, escursioni o qualsiasi altra cosa per rendere la vostra vacanza unica. Situato vicino al fiume Arno (fiume), questo spazioso appartamento offre una splendida vista del 'Parco delle Cascine,' dove la maggior parte fiorentini vanno ogni Martedì per il suo mercato aperto con frutta fresca e fiori, artigianato locale, tra le altre cose belle. L'appartamento è al primo piano di un edificio del 1800. E 'arredato con molto gusto, completamente attrezzata, e tutte le camere sono luminose e soleggiate. E 'molto confortevole con due camere da letto (una con letto matrimoniale, una con due letti singoli), un bagno completo e un mezzo bagno, cucina completamente attrezzata con tutto il necessario per cucinare un delizioso pasto toscano, soggiorno con divano letto (posti letto 6 persone comodamente) e sala da pranzo. Una culla e seggiolone sono disponibili senza alcun costo aggiuntivo. Se siete alla ricerca di una fuga romantica o un amici e famiglia reunion speciale, questo appartamento offre un eccellente rapporto qualità-prezzo e qualità. Questo è sicuramente un fiorentino molto tipico, non turistica zona di punta di punta !! E 'facile vedere i vestiti che vanno al di fuori degli edifici ad asciugare, vecchie signore che vanno al mercato locale, con le ceste di alimentari, e pescatori dei pazienti che provano per fortuna dal fiume Arno durante la domenica. Mezzoretta a piedi per andare in centro, ma costeggiando l'Arno è anche piacevole. Alcune cose potevano essere pulite o pulite meglio, per esempio gli elettrodomestici ( il microonde, l'aspiratore del gas e della cucina) le stoviglie abbiamo dovuto rilavarle. I letti sono piccoli, sono di altezza 180cm dovevo stare con le gambe molto piegate. The owner was very helpful in arrangements for check-in, and the view of the river is quite pleasant after a long day in the city. It is not difficult to get around from here by bus, tram, and taxi. But it is a little ways from the bustle of piazzas and tourist attractions. Two bathrooms are a perk for a unit this size and the three of us had plenty of space. However, the beds are just as firm as mentioned in previous comments and quite old. There is street noise, but in Florence I'm not sure you can get away from that. There were also a few kitchen items to be desired, but overall we enjoyed our stay, made use of the washer, and had plenty of towels and blankets. I would recommend this cute flat. 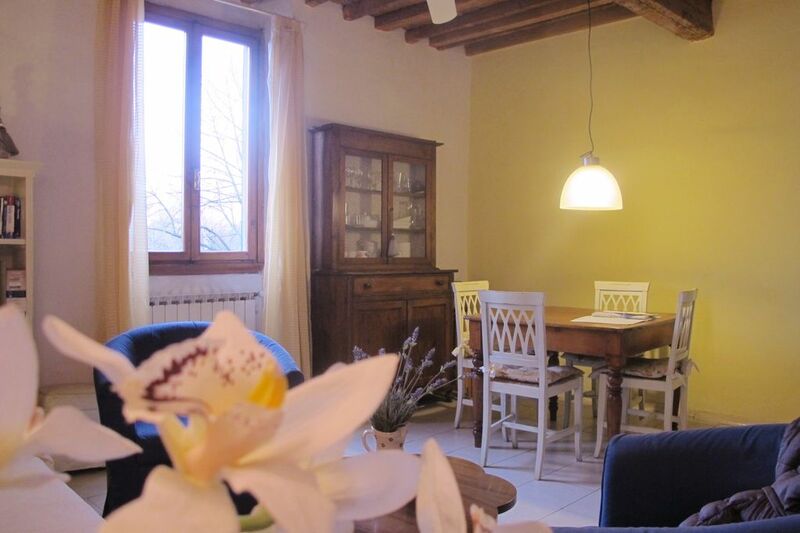 We had a nice family trip in Florence,very convenient location,close to restaurants,tram,supermarket.The apartment is very comfortable and has a nice view of the Arno river,it has everything we needed to cook and wash the clothes,a.c. works very well.Would definitely recommend for families staying in Florence. We had a great time in the Riverfront Flat. The location was away from the main historical center but was an easy walk along the river. The road was busy and noisy outside but the bedrooms were at the back and the noise wasn't a problem for sleeping. Christina met us when we arrived and was extremely helpful showing around the place and giving us advice for the area. She was always available before with to answer questions. The apartment was very clean and just as the pictures showed. The kitchen was well stocked and we cooked several meals there. The gas on the stove went out several times which was a bit frustrating. There is a grocery store a short walk away and a nice little playground our boys enjoyed. Overall, a great stay. Thank you for your very detailed review. Our week at Christina's apartment during the Christmas holiday was fabulous! The apartment had everything we needed; supermarket and restaurants close by, easy walk into the historic city center or metro station and parking just outside the door. The park across the river was an easy walk and absolutely beautiful. We could have easily spent a month there if we didn't have to go back to work... Thank you Christina! Thank you JB, for taking very good care of my place!! Hope to have you back in Florence.